Heavy-duty industries depend on adhesives in many respects throughout manufacture. Such ruggedized sectors like defense and aerospace require not just high-quality bonds and error-free application, but also materials that can withstand shock and impact. Staking is the process of protecting components by minimizing vibration and reducing pressure on leads using adhesives. The process has many uses and benefits, but the question of what materials to use is always a top consideration. Viscosity: In some instances, a low-viscosity adhesive is useful if the component is potted and application relies on the glue seeping into hard-to-reach areas. However, staking requires precision placement: leads cannot be buried or extended over by the adhesive, and a higher viscosity material is needed so that formations hold and don't creep. Cure: Acetoxy silicone cures have wide use, but in staking applications their release of acidic compounds while curing is detrimental to the process and components. Neutral cure silicone adhesives are then needed to ward against corrosion due to the wrong type of cure being used. Outgassing: Another trait related to adhesive emissions to look at is outgassing. Outgassing is the act of cures emitting contaminating or obtrusive products, sometimes volatile, sometimes not, that may interfere with components. Materials applied to parts used in space (satellites or rocket propulsion systems) must not only be able to survive in extreme cold, but also conform to NASA-established outgassing standards. Moisture-cured materials, for instance, may fog up and disrupt optics. Thermoplasticity: Heat staking is a common method for attaching dissimilar substrates or transistors, diodes and circuits to boards. Users will want to be sure their chosen adhesive's threshold of thermoplastic expansion is aligned to or within the range of tolerable conditions for the materials it's being bonded to. Conversely, ensuring an adhesive will not melt at normal operating temperatures for parts is important as well. Shear strength: High shear strength is a valued property in staking materials. Given all the vibration and impact components and adhesives are subject to in rugged uses, it's critical bonds can hold up against shearing force, or when parallel surfaces move against each other. 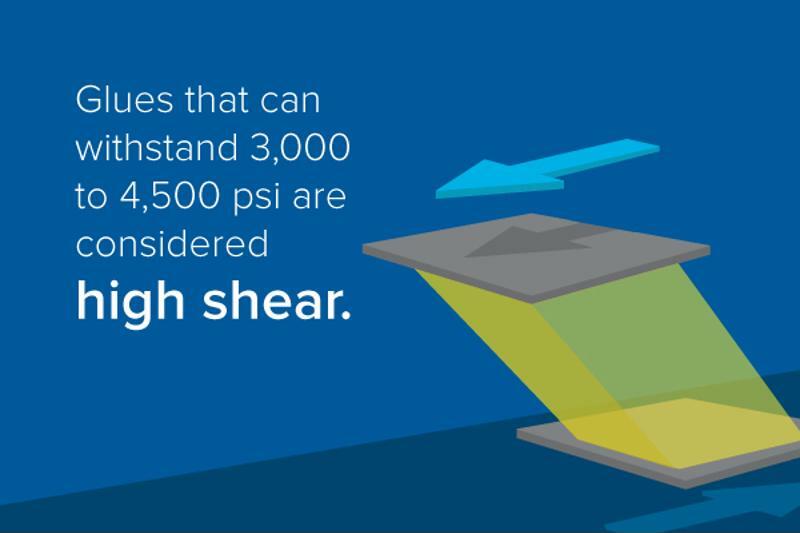 Glues that can withstand 3,000 to 4,500 psi are considered high shear. High-shear materials are routinely used in staking applications. Epoxies have seen their use surge in modern times, and both one-part and two-part epoxy systems can be used in staking applications. Epoxies are a particularly popular and dependable choice for use in products sent into space, according to Machine Design. Their versatility, cohesion properties and adaptability through engineering make them good fits, as epoxies passing the NASA ASTM E595, the outgassing standard, can grant cryogenic serviceability, optical clarity, thermal conductivity or insulation and resistance to vibrations, thermal shocks or impacts. One-part epoxies are cured using heat, creating sufficient bonding; but two-part epoxies are mixed with a resin or other hardening substance that increases the strength of their adhesive qualities, and thus make them even more suitable for use in staking. Two-part epoxy systems like the Henkel Loctite Ablestik 55 are suited to usages in electrical assembly and for purposes like insulation and resistance, key objectives of staking. Mechanical Design added that two-part epoxies can even be treated in a third phase of curing, which can further improve outgassing tendencies. One thing to watch for in epoxies is durability over time, as some epoxies are prone to overhardening, which can then lead to cracks and splits that expose components. As previously noted, when considering silicone adhesives in staking, neutral cures are a must. Silicone may be preferred in some applications because of its increased strength and nonflow qualities. Indeed, the Dow Corning 832 Multi-Surface is a nonslumping, noncorrosive, flexible silicone paste used for bonding a variety of dissimilar materials, including as concrete, glass, plastics, metals, and rubber. It is recommended for marine equipment, assembly equipment, roof penetrations, concrete floor seams and windows. Meanwhile, the Dow Corning SE 9168 silicone adhesive is expressly suited for use in vibration dampening and circuit board repairs. Properties like nonflowing, tack free and flame resistant make it a high-quality choice. Hot-melt adhesives also have use in staking. Often one-part and solvent-free, these glues are viable in staking operations because of their fast cooling properties and range of chemistries. However, there are drawbacks to using hot-melt adhesives, particularly in relation to dispensing. Staking requires precise application, and hot-melt dispensing can be more of a quick-and-dirty method where not enough attention is paid to how carefully the hot-melt is dispensed. There is also the tendency for these adhesives to run (which is a big risk if leads are overrun by the material), and long-term durability is also at question.